I quickly discovered I was working for an agency whose morale was among the lowest in the U.S. government. In private, most TSA officers I talked to told me they felt the agency’s day-to-day operations represented an abuse of public trust and funds. The scanners were useless. The TSA was compelling toddlers, pregnant women, cancer survivors—everyone—to stand inside radiation-emitting machines that didn’t work. 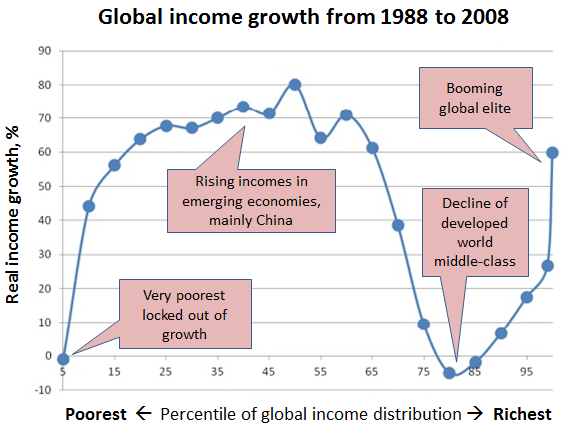 Source: Milanovic, B., Lead Economist, World Bank Research Department, Global income inequality by the numbers. Annotations by James Plunkett. A federal judge today upheld a President Barack Obama administration policy allowing U.S. officials along the U.S. border to seize and search laptops, smartphones and other electronic devices for any reason. When does technology sufficiently constitute our “person” such that we must be legally secure in it, in order to have a functioning democracy of citizens? To what extent should citizens be required to trust the government to only enforce laws “reasonably”? To what extent should government be required to trust citizens to be acting reasonably, without suspicion otherwise? Or to what extent should the government act to find reasonable suspicion?